100 Scuba Dives, The Enthralling Underwater Experience Of Dheeraj ! 100 Scuba Dives Checked Out From Bucket List! 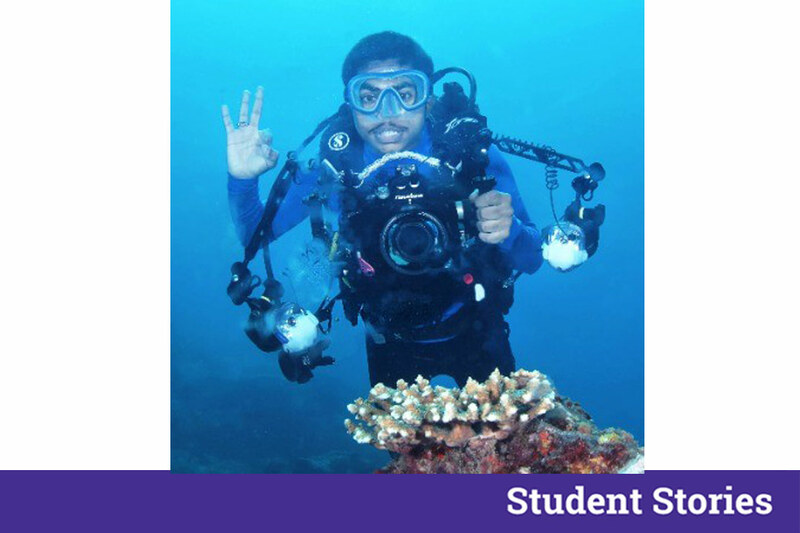 Here’s The Enthralling Underwater Experience Of Dheeraj M Nanda! The ocean stirs the heart, opens the imagination and brings eternal joy to the soul. A man cannot discover the new oceans unless he has the courage to lose the sight of the shore. He who searches for the pearls must dive below. From the birth, man carries the weight of gravity on his shoulders and he is bolted to the earth. But man has only to sink beneath the sea, and he is free. Diving is an investment of time and money, but the rewards can be life changing, literally. Hi!, I am Dheeraj M Nanda, studying 2nd year PUC in MVJ PU College. I have a keen interest towards nature photography, diving and cycling. 2) Tell us about your passion for photography ? I was exposed to photography at a very young age. My brother, a photographer inspired me to take a camera and capture the essence of nature. My father, tagged me along all his journeys which enabled me to capture great pictures from landscape to macro and all the way into under water world. 3) How and when did you develop interest towards under water photography ? I was inspired by all the insights and documentaries broadcast-ed by NatGeo and Discovery. It has been 4 years since I started diving. Being a photographer, it was quite natural to take cameras under water and capture what the under water ecosystem has to offer. Moreover this was not a thing which lot of people did and this made me select it as my main genre for photography. It feels great after every dive I complete and to have completed 100 scuba dives before turning 18 was a goal for me. I feel privileged to have crossed that number on my dive log. The sea is all about experiences! 5) What kind of challenges do you face in under water photography ? The most common challenge is not being able to recognize a creature as we cannot fathom that something like that exists and they are of extremely small sizes ranging in millimetres. Other technical challenges are lighting and positioning of strobe lights which I overcame by experimentation. Also Read: Poetry That Leaves You Mesmerised! Meet Cipun Mishra Who’s Painting The World Red With His Wonderful Poetry ! I use an all Canon kit, Canon EOS 7D with a nauti cam housing, 100 mm macro lens underwater, mainly to capture macro creatures or a 15 mm fish-eye lens to capture wide angle. On land, I use a Canon 100-400 IS II to capture wildlife. 7) What is that one source of inspiration that keeps you moving ? A big source of inspiration are my parents and my brother who constantly encourage me and always guide me to the new adventures to embark on.